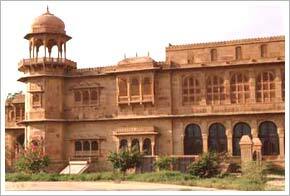 Pay a visit to Bikaner and explore the unparalleled beauty of Lalgarh Palace. Telling the story of the royal legacy of the Maharajas of a bygone era, Lalgarh Palace is a marvelous piece of architecture built in 1902 by Mharaja Ganga Singh. He built it in the memory of his respected father Maharaja Lal Singh Ji and also named it after his father. The palace was made in red sandstone. Its austere beauty is the result of the perfect mingling of Rajput, Mughal and European style of architectures. Its construction was initiated in the year 1902 and completed in 1926 and the celebrated British architect Swinton Jacob designed this wonderful palace. Some portion of the palace is still occupied by the members of the royal family. You can even enjoy a regal stay at Lalgarh Palace as it has now been converted into a heritage hotel. The heritage hotel is under the supervision of the famous Welcome Group Of Hotels. All the modern amenities are provided here. Lalgarh Palace is an amazing assortment of several big halls, lounges, cupolas (dome like structure), pavilions and a huge library which is rated as the the fourth largest library on Earth. It is known as Shri Sadul Library. The main highlights within the Lalgarh Palace are its towering pillars, beautiful fire places, and Italian colonnades (a structure composed of columns placed at regular intervals).The interiors of the palace are adorned with awe-inspiring lattice and filigree(delicate and intricate ornamental work made from gold, silver, or other fine twisted wire) work.